There are some ridiculously expensive baby items out there. Some spoil the baby, others are just spoiling mommy. Either way, if you are attracted to these items but don’t have the money to spend, we have some alternatives for you. Of course parents want to spoil their precious bundle of joy, but would you spend hundreds of dollars on a onesie or a diaper bag? Get a glimpse into the lives of the rich and famous (and their spoiled offspring) by checking out the most ridiculously expensive baby items out there. And don’t forget to take a look at their more reasonably priced alternatives. Pictured left is the Carter’s summer dress alternative to Dior (right). 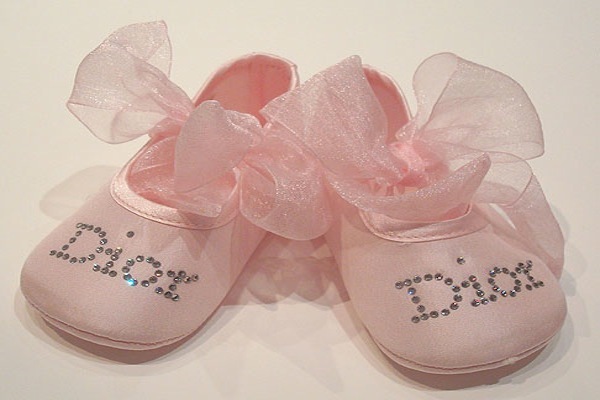 Dior, a French high-fashion company, not only has a line of apparel and handbags for adults, they also make designer clothes for babies and kids. 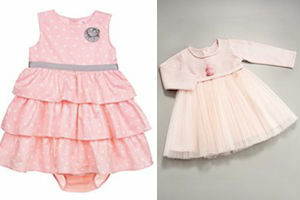 Only the best fabrics are used in the Baby Dior line; this baby pink dress for example is made of silk, cotton and cashmere. Your little girl will be the most expensively dressed belle at the ball… too bad she’ll only have a couple of months to wear this pretty dress before she grows out of it! For a more affordable clothing line, Carter’s has a great selection for boys and girls. Although they don’t use lavish fabrics like Dior, you’ll get your money’s worth out of the clothes. Plus, you’ll have extra money to buy matching tights, shoes, sweater, hair bow and a lot more! The BOB Revolution (pictured right) is the affordable alternative to the Roddler (pictured left). Want the most stylish and expensive stroller available? Check out The Roddler by Kid Kustoms. Each stroller is hand-built and made of quality materials like high grade leatherette upholstery, ultrasuede and chrome. The chassis, seat and fender are also customizable, ensuring that Mrs. Copy-cat down the street won’t be stealing any of your thunder. It also transforms into a trike, so when your kid outgrows a stroller, they’ll have something else to ride around on. The BOB Revolution Stroller to an extent is customizable; you can choose the color and pick different accessories to go with the stroller. It’s also a Viewpoints favorite for jogging strollers because of its three wheel design and state-of-the-art suspension. 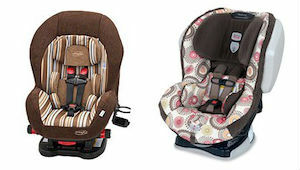 The Evenflo Triumph (left) is highly rated and considerably cheaper than the Britax (right). Britax is well known for its car seats, but it’s also known for their hefty price tags. So it shouldn’t surprise anyone that it makes one of the most expensive car seats. The Britax Advocate 70 CS boasts 19 features that make this car seat superior to others including side impact cushion technology, the Harness Ultra Guard System, an easy to remove cover, the Click & Safe snug harness indicator and more. Considered one of the best toddler car seat by Viewpoints parents, the Evenflo Triumph Advance LX car seat is much more affordable. What’s also great about this car seat is that it’s convertible and has all the features you’ll need in a car seat like EPP Energy Absorbing foam liner, a 5-point harness and meeting side impact standards. 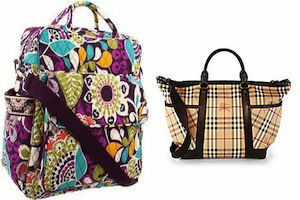 The Vera Bradley baby bag (left) is nearly $900 cheaper than the Burberry one (right). This iconic London fashion house created a luxurious quilted diaper bag. The Burberry Quilted Check Tote definitely doesn’t look like an ordinary diaper bag. Made of super soft lambskin, this diaper bag has a large interior for diapers and clothing, a small zip pocket for your keys and wallet and two patch pockets for baby bottles. Although some might say that the $97 price tag is still high, the Vera Bradley Baby Bag is worth the splurge. This diaper bag comes in a variety of patterns (some that are on sale for $65), has 11 pockets inside and out, a special clip for pacifiers, a lined interior for easy cleaning and also includes a matching terry-covered changing pad. If you’re lucky enough to bag yourself a Bill Gates, win the lotto, or become Donald Trump’s next Apprentice, you might want to remember these ridiculously expensive baby item. Not so lucky? The reasonably priced baby items work just as well as the expensive ones. 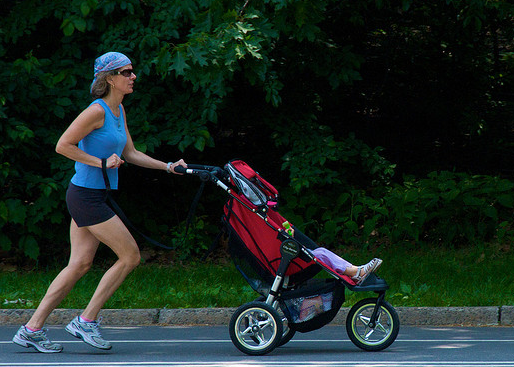 Having a new baby can make it hard to find the time to workout, which is why many moms and dads turn to the jogging stroller. 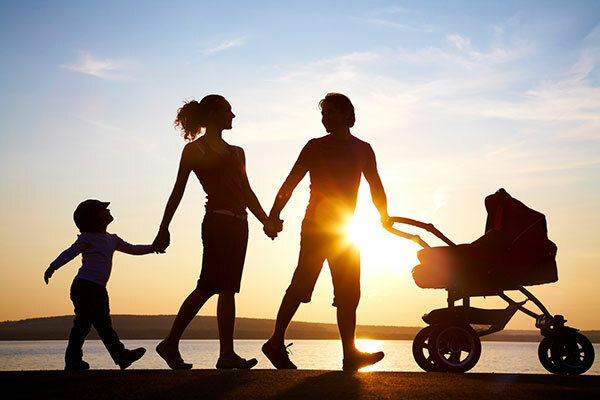 It’s an easy way to get the baby out of the house, and you on your feet, but you want to avoid what our health conscious jogging parents found to be the worst of jogging stroller. From bent frames to ribbed fabric, reviewers found that it’s important to do your research before purchasing a jogging stroller that will help you stay fit and keep your child safe. Online shopping is a great way to avoid the hassle of the mall and save money on kids clothes. When my kids were babies it was fun to bring the stroller to the mall and browse as they napped in their infant carriers. Now that they are bigger, louder and faster, malls have become hazardous. They beg for impractical items and when I say “no,” tantrums ensue. I end up without the plain white undershirts and warm winter sweats that I went to the store for in the first place. So, I’ve started to avoid the hassle and save money on kids clothes buying everything online. 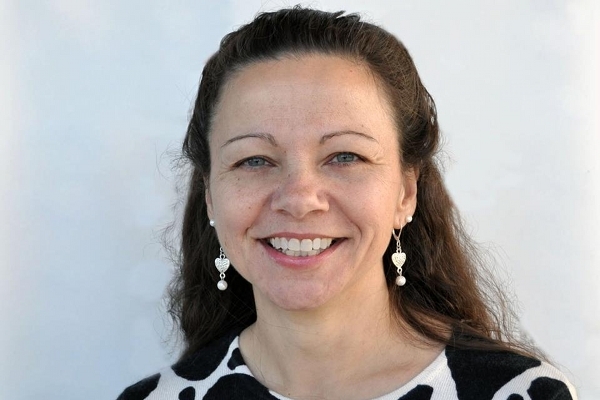 Carol leads the content team at Viewpoints. Write to her with article ideas or other suggestions for Viewpoints at carol@viewpoints.com. Amanda Bryant is a design professional with an interest and expertise in products for the home and office. She is founder and principal of HangItUp Chicago, a fine art rental business partnering exclusively with Chicago-area companies. Jason Van Steenwyk has been writing about personal finance and investments since 1999. He first learned the trade as a staff reporter with Mutual Funds Magazine, part of the FORTUNE Group of magazines at Time, Inc. Since then, Jason has been published in many financial consumer and trade publications. Rachel Leipzig has been styling hair in Chicago for 15 years, after relocating from New York City and opening a salon in Chicago’s Gold Coast. A specialist in makeovers, her television appearances include Oprah, ABC, and FOX. Leipzig’s work has also been featured in Allure, Chicago Social and Today’s Chicago Woman magazines. Alison Muller is an educator and mother of two young children. She teaches cloth-diapering classes, and she loves taking her kids to the park and reading fiction. Jessie Veith Rouleau is a full-time mom with two kids, Sam, 3, and Mia 2. When she’s not pushing strollers, buckling car seats, washing hands, and reading stories, she’s writing about the products that help make mom’s day a little bit easier. At the park, when you’re talking baby and kids, she’s listening. Marci Rich blogs about life after 40, after divorce and after cancer at The Midlife Second Wife — a mix of inspiration, comfort and humor. Karen started her writing career by writing product reviews. She has been published in national magazines and websites such as Examiner, Yahoo! News, Yahoo! OMG, Sports Blog, and Chicken Soup for the Soul books. Her expertise in vitamins, herbs and minerals began as a personal journey, seeking out natural remedies to improve her health. Jackie Conn is a penny pinching, stay-at-home mom who has researched and written reviews for 7 years. 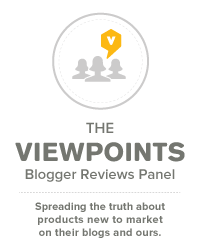 Sarah Mock has been a member of the Viewpoints Blogger Reviews Panel since formed in August, 2012. Her blog, How I Pinch A Penny, is devoted to helping others save money. She regularly shares creative ideas for increasing value and living green from her home in York, Pennsylvania. Miranda Marquit specializes in financial topics including personal and family finance, small business and entrepreneurship, and investing for beginners. Her work appears on financial websites including Yahoo! Finance, Business Insider, MSN Money, U.S. News & World Report and Wise Bread. Miranda has her own blog, Planting Money Seeds. Allegra Pusateri is an intern at Viewpoints. She recently graduated from DePaul University with a B.A. in English and Creative Writing. Jimiece Gilbert is a writing intern at Viewpoints and a 2013 graduate of the University of Illinois at Urbana-Champaign, where she majored in Communications. Along with writing, Jimiece’s creative passions are dance and music. Saba Hamid is a manufacturer outreach specialist at Viewpoints. She is a California native and recent graduate of Loyola University Chicago with a B.A. degree in Sociology. Gib Olander leads Local Viewpoints, a mobile-optimized survey platform based in Chicago which enables businesses to collect, analyze and publish feedback from their customers to grow their businesses. A sit and stand stroller is a great option for a growing family who needs help with infants and toddlers. So, you have a stroller you love and it works great for you and your baby. You rave about it to friends and acquaintances. You never leave home without it! But what will you do when your family starts to grow and your beloved single stroller no longer meets your needs? Depending on the age of your children, you may want to consider a sit and stand stroller. Lots of families turn to double strollers that accommodate multiples, but sit and stand stroller tend to be really convenient for older toddlers and preschoolers. Baby proofing is an important part of having a toddler crawling around the house. Use the best product to ensure your little one’s safety. 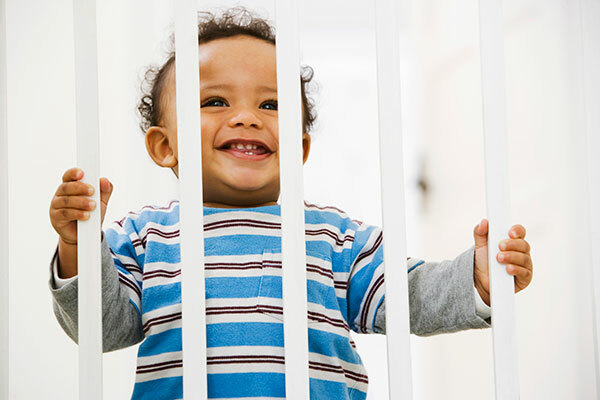 When my son was two he learned how to maneuver around our inferior baby gate, making it more of a hazard than a safety guard. Score: Baby – 1, Parents – 0. I soon discovered that the outlet covers we selected were no match for his little probing fingers. When I found one in his mouth, I knew we’d been defeated! Lesson learned: Baby proofing isn’t easy. Buy what works so you can relax at home. Let’s talk about what a really good stroller looks like. It’s the kind of stroller that never gives up, is never a burden to use, and lasts longer than your child needs a ride. One of my personal favorites, the Maclaren Quest Stroller, fits just that description—and Viewpoints reviewers agree. The Maclaren Quest Sport Stroller (92/100) does not disappoint. It provides a safe and secure place for your little one without all of the hassle of a large and complicated stroller. 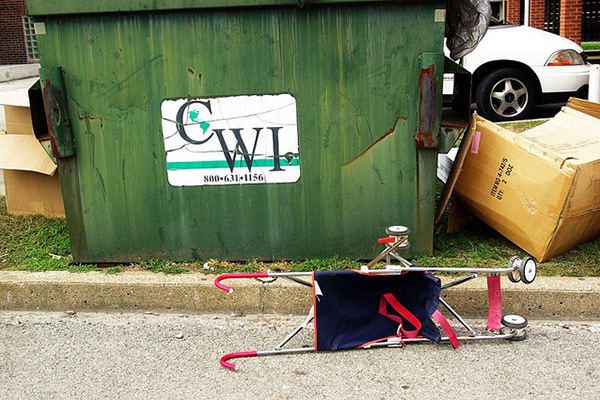 The worst strollers are flimsy, too small, break easily and don’t provide the needed support for your little one. For families on a budget, quality and affordability are incredibly important when shopping for baby gear. Strollers tend to have a wide range of prices, ranging from less than $20 to nearly $1,000. The many choices available, coupled with the huge range of prices, make for a confusing shopping experience for lots of moms and dads. Sometimes it’s more important to know what strollers to avoid, rather than what features to look for.